(2/28) Zach Dagel, Grand Rapids Guide Service. I was out and about on Wednesday checking fresh fishing spots for a fishing group that arrives today. Travel conditions on the ice are still tough. Along with my fishing buddy Grant Prokop, we visited several area lakes including Round Lake, Cutfoot Sioux, Little Cutfoot and finally, Bass Lake. A lot of what you're hearing about the slush is true. We got opur Ranger (no tracks) stuck twice on Wednesday and digging out was no easy job either time. Until we see more of the snow disappear, the slush is going to stick around. Ice fishermen who have snowmobiles might get around better, but even the wide tracks are at risk of burrying in the slush. If you're heading this way for the weekend and want to play it safe, plan on using the plowed roads on the larger lakes ... Click to drop me a line >> grand rapids guide service . 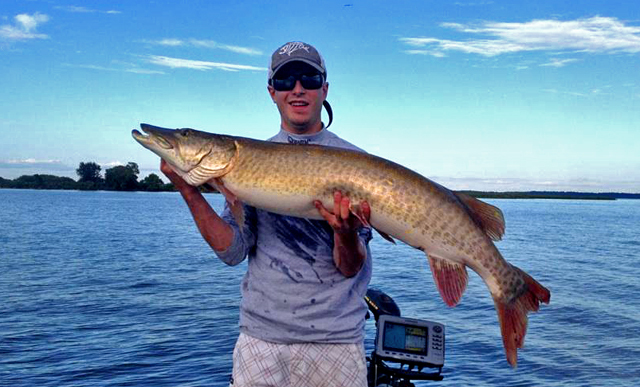 (9/14) Zach Dagel, Grand Rapids Guide Service. Well, we had another great day on Cutfoot Sioux today. The walleye fishing was a little slow due to the cold front that moved in. When I left the house this morning, the truck thermometer said 39 degrees. And at the lake, surface temperatures had already dipped into the mid 60's. We started of fishing walleyes this morning, but after the first hour I could already tell it was going to be a slow start. I've learned a lot this year from my good buddy Jeff Sundin, who has taught me one thing for sure; That's how NOT to turn a bad day, into a horrible day. So with that bit of knowledge in mind. 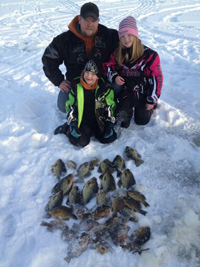 We decided to switch things up a little bit and started looking for some crappies instead. 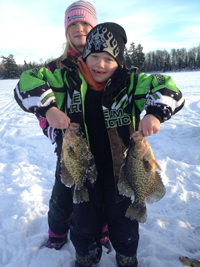 It took a little while to find a decent school of Crappies, but after some searching we did locate a good school. These fish were active and I'd say that it was pretty easy pickin's. There were a lot of really nice, 12 inch fish mixed in with a bunch of the little ones. We found 1 that was a whopper. at 14-1/2 inches, one of the best fish of the season so far. 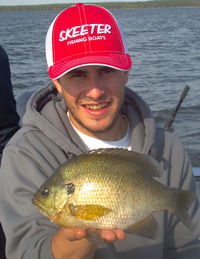 Well I have a day off tomorrow, but I'll heading down to Breezy Point Resort for the 2013 skeeter photo shoot. I'm pretty excited to go see all of the new boats and looking forward to the experience. Click to drop me a line >> grand rapids guide service . (9/4) Zach Dagel, Grand Rapids Guide Service. Walleye fishing On Cutfoot Sioux and Lake Winnie changed a bit since the big winds. I've been doing a little exploring on Cutfoot Sioux and with the wind under control, Walleye action picked up good on Tuesday afternoon. We fished the weed edges in about 12 feet of water and caught our 18 Walleyes between 3:00 and 6:00 PM. The best presentation for us is still Lindy Rigs and night crawlers. Click to drop me a line >> grand rapids guide service . (9/4) Zach Dagel, Grand Rapids Guide Service. 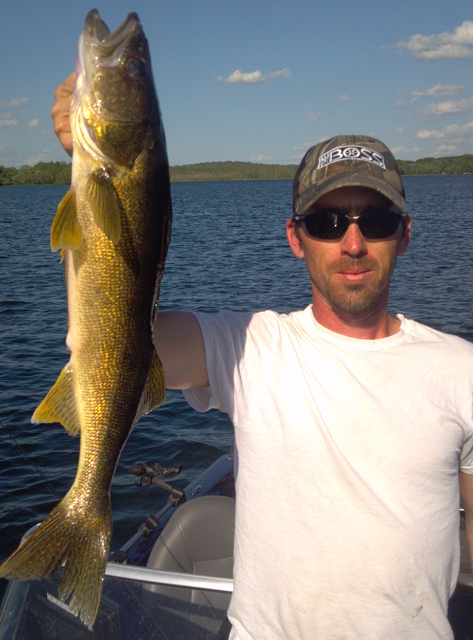 Walleye fishing on Lake Winnie has been good for me the past couple of days. After looking at a bunch of deeper water spots and finding little or nothing out there, I've spent all of my time in shallow water. The weedline bite is where it's at again and we've been finding fish in six feet of water, even shallower at times. The key to our success was going at a speed of .08 MPH, using a quarter ounce weight. Walleyes are scattered along the inside edges of the weeds, nearest the shallow water breakline. 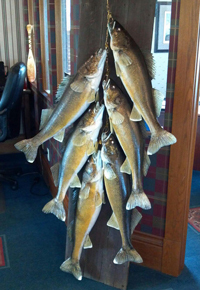 Don't forget, the Denny's Resort/Southfork Pub Walleye tournament is scheduled for September 8th, 2012. It's a little different program than a lot of tournaments so be sure to Click and view the flyer >> Walleye Fishing Tournament, Lake Winnie . (8/18) Zach Dagel, Grand Rapids Guide Service. I just wanted to be sure that everyone knows about some friends and customers, who are sponsoring a Walleye Fishing Tournament on Lake Winnibigoshish. The tournament is scheduled for September 8th, 2012. It's a little different program than a lot of tournaments so be sure to Click and view the flyer >> Walleye Fishing Tournament, Lake Winnie . (8/6) Zach Dagel, Grand Rapids Guide Service. Fishing on Winnie this weekend, we found fish in a little bit deeper water than they've been using lately. The bite on the lake wasn't bad, but it was fantastic either. After we spent most of our time trolling with Crankbaits and Spinners during pre-fishing, the bite for us this weekend turned out to be better using jig and minnow. All of the spots you've been hearing about lately continued to produce fish. Our better loactions we found at the outer edges of the deepest weeds. Fourteen feet of water was a key depth. (8/4) Zach Dagel, Grand Rapids Guide Service. We've been doing a little exploring in the Grand Rapids area this week. Working with my friend Grant Procup and well known photagrapher, Bill Lindner, we've been on the water searching for fish. Bill has been interested in finding Largemouth Bass for some photos, but along the way, we discovered some really nice Sunfish and even a nice school of Smallmouth Bass. The Sunfish are stacked up just inside the outer edges of the weedlines. That could mean anywhere from 8 to 16 feet depending on the lake you fish, but the trend is solid. Reports from other friends and guides confirm that they're catching fish in the same types of areas. One of the keys to finding Sunfish is to move along the weedline, fishing with a bait that gets their attention. Trolling for Walleye with Leeches or Night Crawlers will get you into the areas where Sunfish hide. Once you get one or two nice ones, stop the boat and switch your presentation to something smaller. 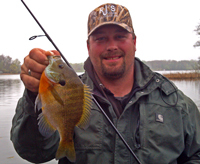 Sunfish will usually stick to a fairly small area, so concentrate on finding the sweet spot, then either hover with your trolling motor or anchor the boat. Smallmouth Bass are schooled up right now. We discoverd a nice school of fish gathered up on some man made support pilings. There are other schools of Smallmouth located on the deeper edges of rock point, sunken islands and hard bottom, mid lake humps. The exact depth oif the fish will vary with the habitat in your lake, but will generally be somewhere from 12 feet down to as deep as 35 feet. During mid-summer, it's typical to fish Smallmouth Bass using Lindy Rigs and live bait, but if you want to catch them on artificials, try drop shot rigs or use tube jigs in much much smaller sizes than you would for Largemouth. Smallmouths will eat tiny morsels of food, especially baits that look like Crawfish. Pre-fishing for the MTT Tournament on Lake Winnie has been interesting. We've found fish in shallow water, 9 to 12 feet deep in a variety of locations. Of course, I'm not going to spill too much until after the tournament is over, but if you're heading out for some eaters, trolling crankbaits in the 8 to 10 foot range will get you some fish. So will trolling spinners, like a Crawler harness in the deeper weeds. (7/30) Zach Dagel, Grand Rapids Guide Service. Fishing on Round Lake was intersting this weekend. Surface temperatures were really warm, 78 degrees and the lake is in full bloom. Green from the heavy bloom, there is also a heavy layer of snails on the bottom of the lake. We were forced to use floaters on our rigs to help get the baits off of the bottom. 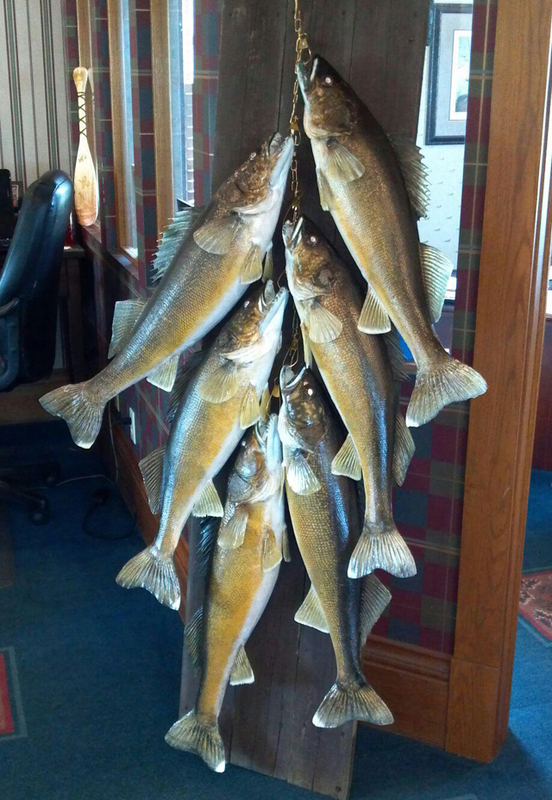 In spite of the heavy bloom, warm water temperatures and the snails, We still managed to bag some Walleyes. It wasn't the fastest fishing I've ever seen, but it was steady and there was a mix of fish that provided for some good eating and some good CPR fish too! We released a number of fish in the 19 to 23 inch range. Our best presentation was a Night Crawler Harness and light, 1/4 ounce weights. The floats that we added to the harnesses kept the rigs from picking up too many Snails. Best fishing areas were located in shallow water. The tops of bars in the 7 to 8 foot depth range is where the Walleyes were hiding and will probably remain there until the water begins to cool again. (7/27) Zach Dagel, Grand Rapids Guide Service. With all of the heat we've had lately, the water on the deeper, clear water lakes has warmed into the action phase. Some of the fish, like Lake Trout get really active, but live out in the deep water where for lots of folks, they get hard to find. The northern pike are about 20 feet down, over open water and we've had success catching them with the downriggers too. We're pulling big stick baits to attract the Pike. 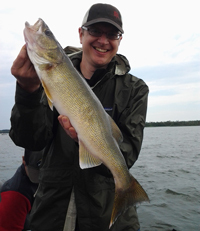 The walleye fishing on big Winnie has also been really good trolling with spinners in 8 to 10 feet of water through the weeds. Some of the big flats like the Bena Bar are starting a load up with a lot of bait too. We are catching a lot of 20 to 24 inchers trolling crankbaits. (6/26) Zach Dagel, Grand Rapids Guide Service. We spent the weekend fishing on Lake Superior. After all of the floodong from heavy rain last week, the city of Silver Bay looked a little torn up, but we were able to move around, no problem. On the lake, the fishing was a little on the slow side, but we did manage to catch some nice fish. The weather and the lake were gorgeous and we had a fantastic time! Before we left, I fished Lake Winnibigosh last friday. We thought the the bite was pretty good in the morning, but for our party, the action really picked up in the afternoon and evening. We found the best school of fish on a 24 foot hump, out in the middle of the lake. Many, if not most of the fish were in the slot, but there were enough keepers to make us happy. The crop of "keeper-size" fish are really looking good right now with many, solid 16 to 16-3/4 inch fish. By the end of the trip, we'd kept 15 fish and released many more in the 20 to 24 inch range. We were fishing with lindy rigs and crawlers. We tried leeches for a little while, but didn't think that they were producing as well as the crawlers did. (6/7) Zach Dagel, Grand Rapids Guide Service. Well for all of the fans of Grand Rapids area clear water Walleye lakes. I"ve heard some awesome reports. I talked to one of my buddies a couple nights ago they caught about 30 fish they were anchored up in about 6 feet of water casting off the break with a jig and a shinner. He said that just before dark the action was fast and furious. Later, they decided to take advantage of the Full Moon and start trolling crankbaits. It wasn't as fast as the action they'd had jigging, but that also worked pretty well. I snuck out last night for a couple of hours to check out the action on a Grand Rapids area Lake. Here's what he had to say; "I like to do things a little differently than many other anglers might do, so tonight, I located a school of fish suspended over 30 to 40 feet of water. Once I had them marked, we started trolling number 7 Lindy Shandling's. We ran the crankbaits in about 10 to 12 feet down and it turned out to be good! We actually caught quite a few fish tonight using this method. It's a good example of how you should respond to your electronics. Lots of times, you see fish on the graph, know that they are there, but fail to try the right thing to catch them. If you see fish, trust your electronics and try an off-beat idea, sometimes it really works. (5/27) Zach Dagel, Grand Rapids Guide Service. Well finally! I had a day off today, went out fishing and my phone has been ringing all morning. 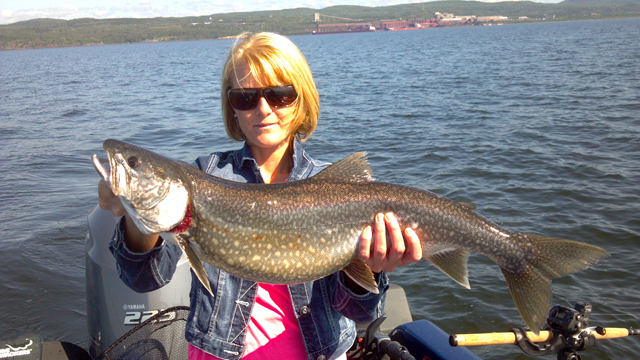 It's been calls from a anglers looking for fish on Big Winnie. The patterns are off of their normal Memorial Day schedule, so if you've been having trouble finding fish in your usual spots, like 6 to 7 feet, don't be afraid to look a little deeper! I've been finding them in 12 to 15 feet. Sometimes, the wind blows and they stage a comeback in the shallows, but I believe the fish are starting to move deeper. On most lakes in the area like Bowstring, Leech Lake and Winnie the fish flies are starting the hatch and I've seen quite a few fish hanging under them in 20 to 24 feet of water. On Trout Lake in Coleraine, in the evenings the Walleyes are sitting in 3 to 4 feet of water after dark. Anglers are having trouble catching them because they are so shallow and spooky. On Pokegama in Grand Rapids, the fish are starting to go too. I've heard 1 decent report about anglers catching fish in 18 to 20 dragging crawlers. I'll be adding more as the week progresses and I get some more boat time. (5/13) Zach Dagel, Grand Rapids Guide Service. We were on on the shoreline breaks fishing in 4 to 8 feet of water. Like most anglers, we were running 1/8 ounce jig and minnow combinations. Keeping the boat speed down to .08 MPH was my key that helped us keep the action going. 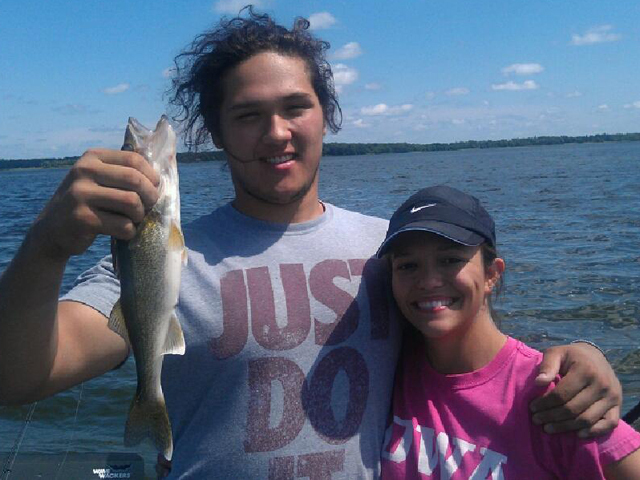 We got our 18 keepers and I think we boated a total of about 45 Walleyes. 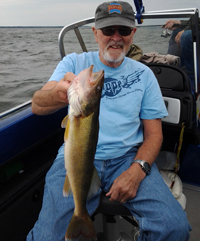 I talked with some friends who were fishing on Leech Lake, they had a great day there too. They were fishing the sand/rocks in the Two Points area and caught a lot of fish using jig and minnow. They said that there were a lot of "slot-fish" but that the action was good. Key depths were 8 to 9 feet of water. (5/11) Zach Dagel, Grand Rapids Guide Service. 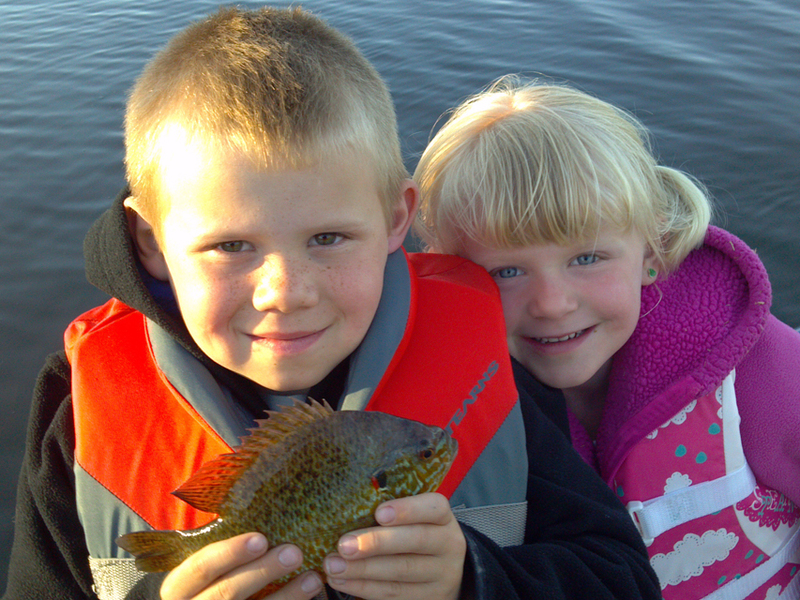 Went out with the kids for a quick trip to find some panfish. The water was actually 63 degrees in pools bay Didn't catch any huge ones but we caught a whole bunch of them. (5/7) Zach Dagel, Grand Rapids Guide Service. Well, I had a few hours to go fishing on Sunday evening. The weather wasn't fantastic, but it really wasn't that bad, just a little damp. We went to pokegama looking for Crappies and Bluegills. Apparently the cold, rainy weather affected the Crappies more than the Sunfish because we didn't have much luck with the Crappies. The surface water was 55 degrees today, but it had been as high as 57-58 degrees just 2 nights ago. The good news though, is that we found a lot of nice Bluegills. Most of the fish we caught came out of 3 to 4 feet of water in shallow bays. so I think to crappies slid out a little bit. We didn't have a whole lot of time tonight but it was fun getting out in the boat. Can't wait for the opener! (5/1) Zach Dagel, Grand Rapids Guide Service. The Walleye opener is on the way and I'm not letting any grass grow under my feet. I spent last week getting my jig supply put together and then on Thursday, my shipment of new "Zach Dagel" Planer Boards arrived. The boards feature a "Spring Flag System" that I know you will love. 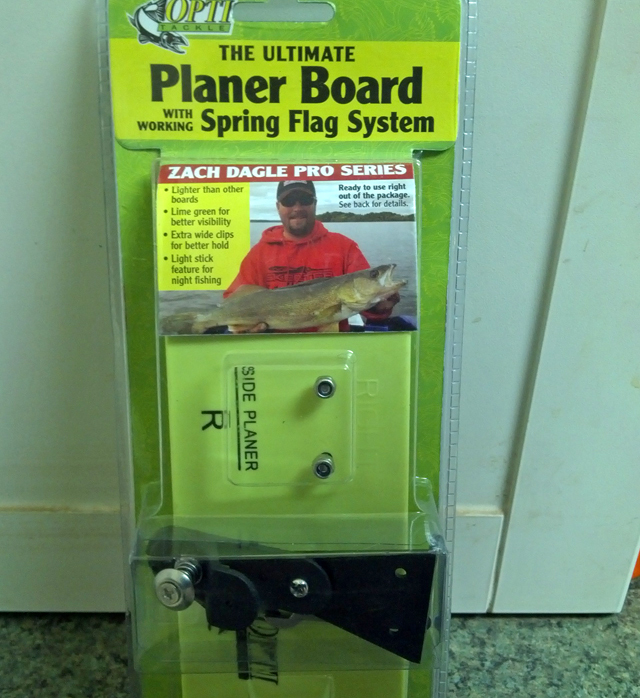 These planer boards are great for running spinners and crankbaits! We have 5 styles and sizes, so there's a board to meet all fishing situations. In the Grand Rapids area, you can them up at L & M Supply. Around the state, they're available at Mills Fleet Farm, Gander Mountain and Scheels Sports. These are just the first items to hit the market, we've got more on the way, so watch for announcments! (5/5) Zach Dagel, Grand Rapids Guide Service. 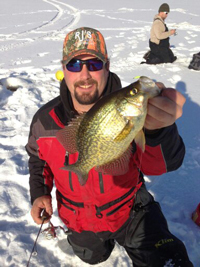 The word around Grand Rapids is that the panfish action is starting to pick up. I wanted to follow up on that so I talked to Ben Kellin at Ben's Bait today. 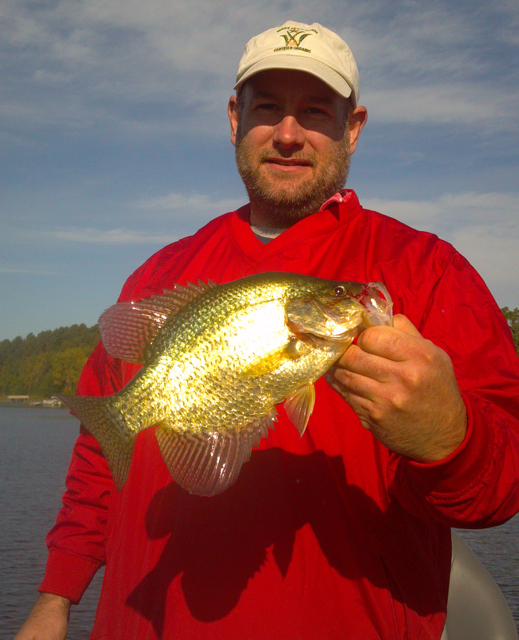 Ben said that most of the local crappie lakes are starting to turn on. 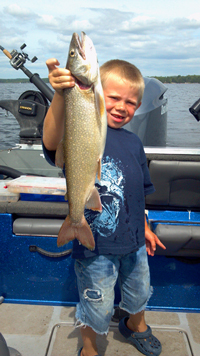 Lake Wabana, Pokegama, Splithand and Bass Lake are some of the better choices. The full scale spawn has not started yet, but fish are difinitely staging in areas where they will move in as soon as the water warms up a few degrees more. Watch for temperatures in the high 50's to low 60's, that will be the sign that you're on the right track. Talking about the Walleye opener, Ben said Spot Tail Shiners are going to be plentiful for anglers in Grand Rapids next weekend. Ben's has about 100 gallons of spottails coming in wednesday. The weather for opening weekend looks awesome. For anyone that hasn't bought a license yet you better run down to your local bait shop and purchase one! Our time is running out and that's great news for me, I cant wait too get out there. The West End Bait Shop, formerly owned by our friend Mark Miner, has been sold to the company, "Little Stores". We'll be hearing more about the transition early this week. But if you see Mark, be sure to wish him well! 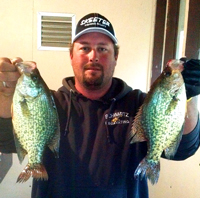 Zach Dagel (below) and his customers turned a slow Walleye day into a great Crappie day. Always learning, Zach has discovered one of the secrets to making smiles appear on customers faces; Find 'em something to catch! Rigging night crawlers in the weeds has been the best bet for Zach and his customers. Simple, but effective. Leech Lake Muskies are heading toward the rocks. Fishing areas like Submarine and the Annex, Grant Procop raised about ten fish and CPR'd this 48 incher. 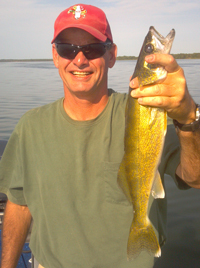 Pre-fishing for the MTT Tournament on Lakew Winnibigosh, Walleyes were hitting Crankbaits in shallow water. 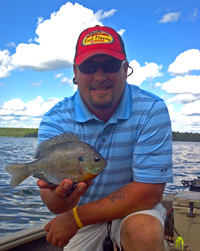 Trolling slowly along the weedline reveals Sunfish locations. Once you find 'em, slow down and work "the sweet spot". A mixture of eating size fish and some CPR fish made the day interesting. 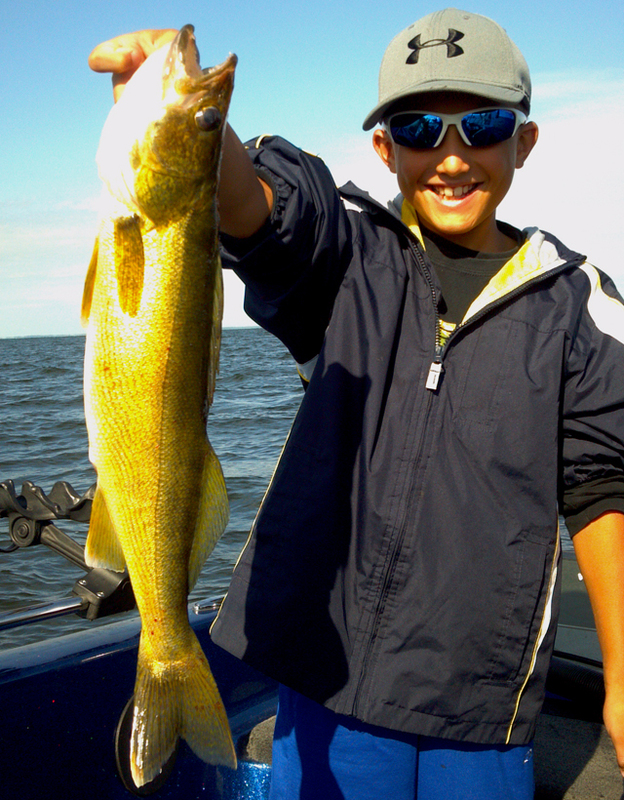 Walleyes were cooperative on top of shallow bars and humps. Silver Bay, Lake Superior fishing wasn't wide open, but there were some nice fish for us to catch. 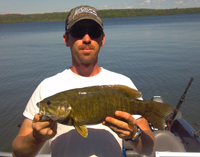 Early June is prime time to hammer out a mixed bag of Smallmouth Bass and Walleye. Grand Raoids area lakes are at their peak for this typ of fishing right now. The water was actually 63 degrees in Pooles Bay. Didn't catch any huge ones but we caught a whole bunch of them. Most of the fish we caught came out of 3 to 4 feet of water in shallow bays. Crappies slipped out after the cold front, but they'll be back too!